Would it be wrong to say that I'm not a fan of the Harry Potter books? It isn't anything to do with the charges of Satanism and witchcraft. Rather, it has to do with that I have read only one in the series, and I wasn't overwhelmed with it. In short, I don't think Harry Potter & The Sorcerer's Stone was well-written. I have been told by the fans and champions of the series that the first one isn't the best of the bunch, so at least I don't feel all that isolated in my views. The film version is faithful to the source, and this may be part of the overall problem with Harry Potter and the Sorcerer's Stone. (Author's note: from henceforth the film shall be referred to as The Sorcerer's Stone). Harry Potter (Daniel Ratcliffe) is an orphan left at the doorstep of his nearest relatives, his Uncle Vernon Dursley (Richard Griffiths), Aunt Petunia (Fiona Shaw), and cousin Dudley (Harry Melling). He's left there by Professor Dumbledore (Richard Harris), a wizard, Professor McGonagall (Dame Maggie Smith), a witch, and Hagrid (Robbie Coltrane), a giant. The Dursleys are horrible guardians to say the least. I'd argue to the point of being child abusers, although I'm the only one who seems concerned with this: boorish, cruel, indulgent with Dudley but at the very least verbally abusive to Harry. On a trip to the zoo, Harry discovers he's able to talk to snakes. Later, Harry gets mysterious messages from owls which Vernon promptly destroys. He takes the family (and Harry, who is to them a nuisance they must bear) to a remote home, but Hagrid discovers them and gives Harry amazing news on Harry's 11th birthday (which the Dursleys typically ignore): he is a wizard, and all those messages for him are to inform him he's been accepted to Hogwarts School of Witchcraft and Wizardry. Hagrid takes him from the Dursleys and guides him to Platform 9 3/4 to board the Hogwarts Express. On board, Harry meets Ron Weasley (Rupert Grint), who also starting out at Hogwarts and is from a large but poor wizard family. 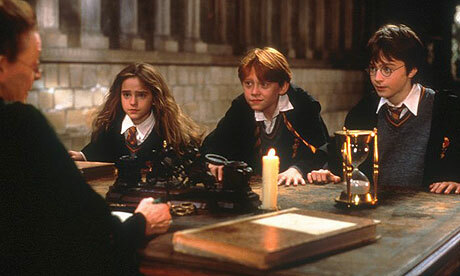 They in turn meet Hermione Granger (Emma Watson), who may be their age but is a mistress of spell casting. Once they arrive at Hogwarts, they encounter Draco Malfoy (Tom Felton), a member of one of the oldest (and most snobbish and evil) wizard families. 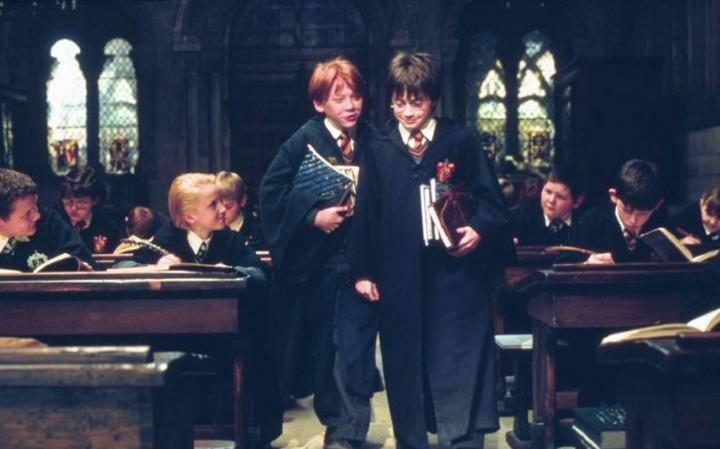 Their first year at Hogwarts is extremely eventful: they survive a troll attack, learn all about the game of Quidditch (which seemed to me a cross of soccer, rugby, and polo with flying brooms), and then get to the main point: the mystery of The Sorcerer's Stone. Someone is trying to get this magic object that will give the owner immortality. Someone is trying to kill Harry. Are the two related? Who could be behind all this nefarious activity? Is it Professor Severus Snape (Alan Rickman), head of Slytherin House? Perhaps Professor McGonnagal (Maggie Smith)? Is it He-Who-Cannot-Be-Named (Voldemort, the wizard who killed Mr. & Mrs. Potter but couldn't kill Harry) or an agent of his? After going through a series of dangers, Harry faces his foe. There really is much to admire about The Sorcerer's Stone. Steven Kloves, adapting J.K. Rowling's book, kept much of her inventiveness, such as Platform 9 3/4 and the Hogwarts Express, her way with names (Slytherin, Draco Malfoy, Severus Snape--all sound quite villainous), or the Mirror of Erised (Desire spelled backwards in case you missed it). Certainly there are wonderful elements for a fantasy story in The Sorcerer's Stone: the school for wizards, complete with wizard-themed snacks and classes, all can bring kids into another world full of fantasy and adventure. Another great highlight is John Williams' magnificent score: the opening theme (Hedwig's Theme) sets the mood beautifully: a magical, light theme that suggests a hint of mystery within it. The performances are also above par. The best performance is that of Coltrane's Hagrid: he was a wonderful rustic charm to this gentle giant. Smith is the type who no matter what she plays she can be both the character and 'Maggie Smith', and her McGonagall is one who has authority and an unspoken sweetness. Harris at times seems to be tottering around as Dumbledore, one who is not prone to be action-oriented but lets his wisdom be his weapon. Rickman wasn't a big part of the film, but his Snape was frightening in his severity, always wearing black and coming across as both overtly villainous and yet simultaneously beneficial to our younger lot. The younger lot was also good. Ratcliffe emerges as someone who has been beaten down by his Muggle relatives (Muggles being non-magic folk) to someone who starts developing a sense of self-confidence and security. The scene where he is expressing his loss and hurt due to his parents' death when seeing himself in the Mirror of Erised was a wonderful performance. He was more than matched by Grint's Ron. He is delightfully scared when needed (adding comedy), and brave when needed (adding gravitas), and childlike when needed (adding innocence). It takes great talent to deliver such lines as "And I thought the Potions Finals were dangerous", or something to that effect, without it coming off as ridiculous. Felton looks the part of a villain with his Malfoy (the slicked back hair, his sneer), but also manages to show that he is still also a child. Only Watson appeared to be a little blank, a little disengaged, a little boring. 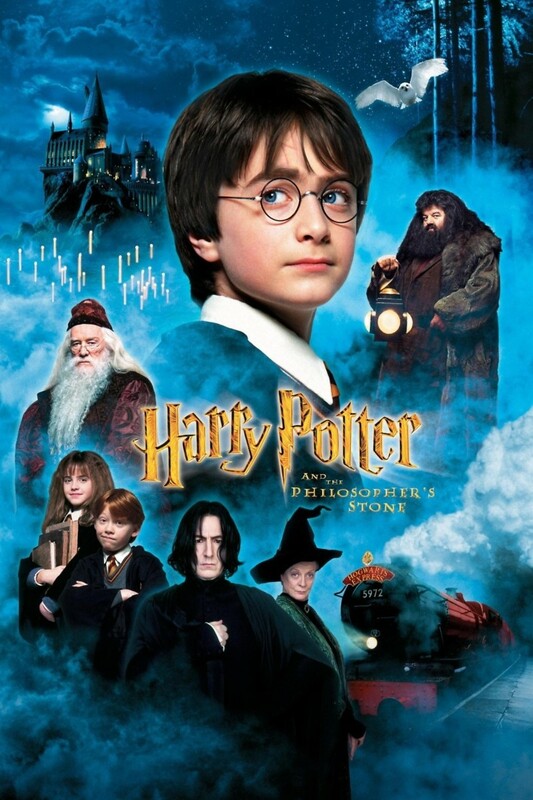 With all the good things in The Sorcerer's Stone, why, after a second viewing, did I still not like it? I think this is the result of director Chris Columbus and Kloves to be slavishly faithful to the source story. It's as if they decided that nothing could be cut or changed lest it displease the fans. This is why the film feels even longer than its two and a half hour running time (an extremely long time for a children's film in my view). There were just such long scenes, such as the Quidditch match, that just seem to go on and on. I have to wonder what exactly the match added to the overall plot. Yes, it did seem to make Snape the villain (which any thinking person would know is a red herring since he's too obvious a choice), but that whole scene could have been shortened without affecting the story. It was there because the fans demanded it, but for those who are not fans, things like this don't invite us to be fans. The same can be said for Neville Longbottom's (Matthew Lewis) flight on his broom. That might have been fun in the story, but how does it relate to how someone is plotting against Potter and to get the Sorcerer's Stone? That, as I understood it, was the central issue of the movie. I kept thinking of these points of logic that I, as a proud Muggle, did not understand. If the Dursleys hated Harry so much (and I suspect this might be a subliminal message to children about how each of them is special regardless of what their parents/others may say), why did they fight so much to keep him with them? If I were as horrid as they were, I would have flung Harry to Hagrid and told him to keep Harry forever and never bring him back. My overall problem here (as with the book) is that how much I HATED the portrayal of the Dursleys. I see it as cartoonish, vulgar, even cruel. Rowling created a strong world for Harry Potter, but the Dursleys seem to be leftovers from a previous draft. There's the issue of when Potter, Weasley, Granger, and Malfoy are sent to The Dark Forest as detention for breaking curfew (side note: is there any other kind of forest beside a dark one?). Why would they send these children to a place where they had been told it was obviously dangerous to go to, to the point the children may be killed out there? This is especially bizarre when you consider that everyone knows Harry Potter is in extreme danger due to He-Who-Cannot-Be-Named. Putting him out there, at a most vulnerable point, does seem foolish at best, a false threat at worse (since we know Harry would never meet any real harm). Moreover, everyone knows who Harry Potter is: he already enters the Wizard World as a superstar (the one who survived Voldemort--another strong name suggesting evil). All the "Harry Potter" "Harry Potter" "Harry Potter" mentioning was frankly getting on my nerves. It's quickly established he's Harry Potter...I don't need to have it repeated endlessly. Also, as imaginative as Rowling was with certain elements in her books, some of her ideas are not. Dumbledore and McGonagall dressed as wizards and witches is just stereotypical, as is the business of dropping a child on the doorstep, and how everything was basically explained in the first few minutes. I still hold that the story could have worked better if Harry had slowly uncovered the truth of his background, instead of everything being revealed pretty quickly. I didn't think the business of the Mirror at the end was very good, in fact I thought how the Stone came to appear extremely simplistic and easy. Harry never did much to actually find the stone (it was Ron, it should be remembered, who was in the Wizard's Chess, the first time I noticed a montage). Finally, the end of term awards were a rip-off: a quick and easy way to get the 'right' school to win. I felt it a bit of a cheat then, and still feel that way now. As it stands, The Sorcerer's Stone serves one purpose: as massive plot exposition to all the succeeding films in the franchise. We need to know who and what the various characters are to get the ball rolling, and if that's the case it did it well. My issue is that a film adaptation should always welcome non-fans, and when it doesn't, when it is made only and almost strictly for fans, it falters. For a lengthy series like Harry Potter, each film should stand on its own. The Sorcerer's Stone barely managed to do that. So far, I still am not a fan of the series, though I see wonderful elements within it. Harry Potter has not been able to put a spell on me. Who would have thought that a few short years later, our little Harry would grow into this? Oddly, the word Harry seems rather inaccurate now, doesn't it?